You have a lot to worry about on test day. What if there’s traffic on your way to the testing center? What if it’s too hot in the room, or too cold? What if your breakfast doesn’t sit well during your testing experience? Oh yeah, and there’s the fact that you are about to take the incredibly demanding and difficult Uniform CPA Examination. With all that on your mind, it would be easy to make a mistake on the day of your appointment that could cost you entry into the testing center. Here are five common, yet easily avoidable issues related to testing center security that are seen on a semi-regular basis by NASBA’s Candidate Care Department, and what you can do to prevent them. login process. Because it is possible to have more than one NTS at a time, it is crucial that you take the correct NTS with you to the testing center. You will not be admitted into the testing center without the correct NTS, and you will forfeit all examination fees should you bring the wrong one. 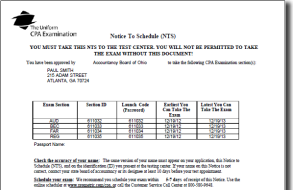 Prior to receiving a new NTS, you should delete all old NTSs from your computer as a way to avoid bringing the incorrect NTS to the testing center. It is important to make sure that the name you register with on your application with NASBA or your state board exactly matches the name that appears on the primary identification you plan to present at the testing center. One common mistake seen by Candidate Care is the use of initials in place of first names. However, the middle initial can be substituted for the middle name (e.g., the NTS reads Michael A. Smith, but the name on the candidate’s license reads Michael Albert Smith), or vice versa. If you have changed your name on your driver’s license, as in the case of marriage or divorce, make sure to update your name with NASBA and/or your Board of Accountancy prior to taking your examination. For detailed information on the types of identification required to enter the testing center, please review Step 4 of The Candidate Bulletin: Roadmap to CPA Success. 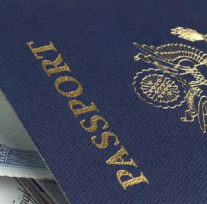 To sit for the Uniform CPA Examination in an international location, your primary form of identification must be a valid (non-expired) Passport with photo and signature, and must also meet the specific country issuance criteria as noted in Step 4 of The Candidate Bulletin. If you are an international exam candidate, your residency status determines the test centers in which you are eligible to take the CPA Exam. To find out where you are eligible to take the examination, take a look at the International Testing Center Eligibility Table. Make sure to read through the list of prohibited items in Step 4 of The Candidate Bulletin before going to the testing center to avoid being written up, or even dismissed, for accessing such items. The list of prohibited items is also written on your NTS. Don’t forget, the testing center will provide you with two double-sided, laminated noteboards and a fine-point marker for making notations during the exam. Also, the testing center will give you headphones to help block noise, but many candidates have reported that they are uncomfortable. If the headphones do not sound like a viable option, you may bring soft, foam earplugs with no strings attached (these earplugs will be subject to inspection). Take the 10 minute break, and do not extend it past the 10 minutes. Arrive at the testing center at least 30-45 minutes before scheduled testing time, otherwise you run the risk of tardiness and being denied your opportunity to test. Avoid confrontations with testing center staff because of the enforcement of rules and regulations surrounding CPA Exam testing. Do not use any parts of your body as a surface on which to write notes, and refrain from taking notes or receipts into the testing center. Don’t forget, if you have any questions or issues you would like to discuss regarding testing center security, please contact our Candidate Care Department at candidatecare@nasba.org.